On the first day with our ZOE we managed a leg of the journey that was 85 miles long, with 10 predicted miles remaining for a total of 95 miles. A fortnight later it went 64.5 miles with 35 predicted miles so promising a magic 100 miles. Clearly, it seemed to me, the ZOE was telling me it’s capable of long distances if I just trusted it. 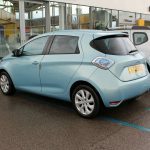 So this week I decided to have a first go at testing the ZOE’s range for real. I charged it last Friday evening, and over the weekend it made a few short trips for a total of about 10 miles. 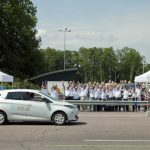 The plan was simple – my journey to work is about 20 miles, so two days at work would add 80 miles, for a total of 90 miles, which would get me close to the magic 100 mile total if I just did a bit of driving around town on my return. 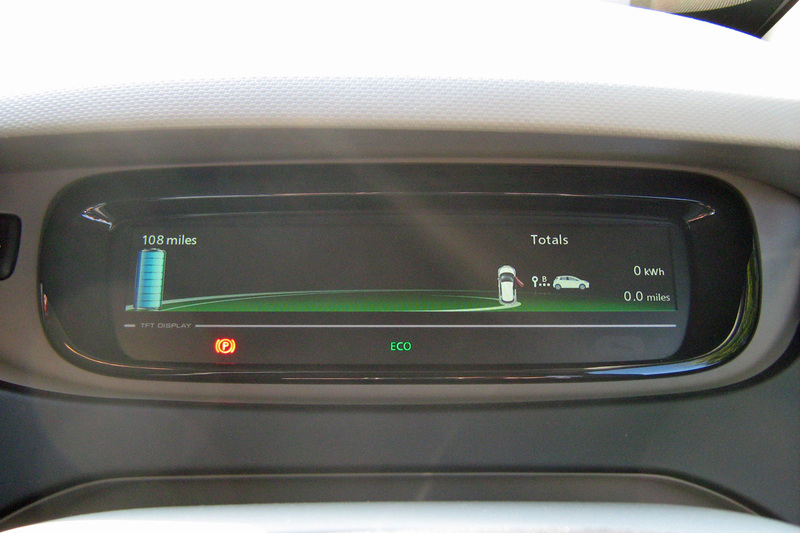 All driving would be in Eco mode, but with air conditioning on as the weather is very warm at the moment. And so it turned out, pretty much to plan. I limited my speed to 40/50mph on Monday and could see I was getting better range than usual. Yesterday morning I limited it to 35/40mph and arrived at work having done about 70 miles, with 30 miles remaining for the 20 mile return journey. I drove home yesterday evening with the speed limited to 30mph, even though I didn’t need to, because I could see I was on track for a very good range and started to get intrigued to see what range I could achieve. Of course, having reduced the speed, after driving home 20 miles the 30 mile promised range remaining had only dropped to 20. 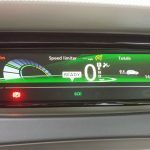 That takes some getting used to – the range prediction is impressively accurate and very useful, but if you improve your driving style, as I was doing by driving each leg of the journey more slowly than the previous one, the total range keeps extending and it feels like a moving target that is continually moving away from you. I went shopping and then just drove around the local area to use up the remaining range to see what could be achieved. 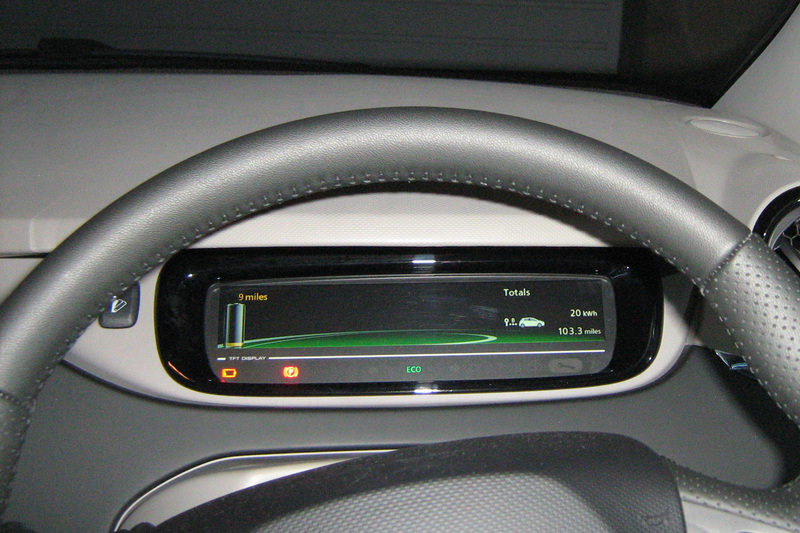 When the energy used reached about 19kWh (equivalent at that point to 14 miles of range) the low battery warning light came on at the bottom of the dashboard, and the battery indicator turned amber. That was fine, it was what I was expecting, and I was close to home with a fair range left (the battery officially holds 22kWh). I continued to drive around and went some distance from home, then turned around at the point where I expected to get home with just a couple of miles of range left. 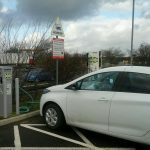 However, at the point where the energy used reached about 21kWh (equivalent at that point to 6 miles of range) the car went into ‘turtle’ mode – the low battery warning light started flashing, the battery indicator turned red, and I had a reduced ability to control the speed of the car (by this point the speed restrictor was set to 20mph, but now I no longer had full control over setting its speed). Suddenly it felt like I had made a mistake and pushed the experiment too far. The remaining range prediction changed from displaying 6 miles to just showing a line of dashes, and that was somehow extremely disconcerting, having no indication of whether there was sufficient charge to get home or not. Furthermore the main charge used display is in whole numbers so there seemed no apparent way of knowing whether “21kWh” really meant close to 21kWh or close to 22kWh (i.e. completely empty). This concern was not helped by me receiving an automatic text alert on my Blackberry saying: “Battery level of your vehicle is low: 6%” – courtesy of the Notification Settings I had forgotten I’d set up on my Z.E. 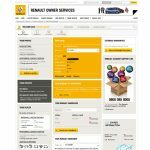 Online account. I continued to head home and – as I have found not for the first time – ZOE came up trumps and we got back without further incident. 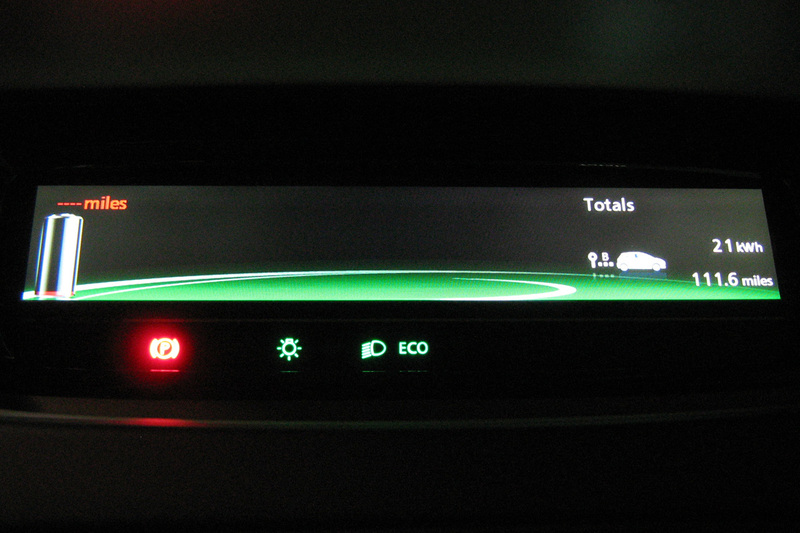 In fact, on looking through the logged data after the trip I found a readout on another screen (‘Onboard computer’) that showed ‘Total consumption’ as “21.0 kWh”, i.e. with a decimal point this time so in fact I probably had most of a kWh left and need not have panicked. Anyway, the experiment was a great success – I had achieved 111.6 miles (about 180km) of range and without trying too hard. Although towards the end of the second day I was deliberately driving slowly to maximise range, for most of the first day I had been much less gentle so there remains an opportunity to improve on this range value just by taking both days more carefully. Furthermore, there were a number of things working against me that could be improved. The route to work was cross country, it has a lot of junctions and is also hilly – I could look for a flatter route. Also I made significant use of air conditioning and, after returning home the second evening, drove a long way using headlights – both of which would have eaten into the range. Finally, the tyres are looking a little flat after weeks of hot weather so could probably be much better inflated. If I try another ‘range record’ – and I am tempted to – I will address each of these issues. I charged the car overnight as usual (the virtually complete charge taking 3 hours 40 minutes). It was heartening to see this morning that the predicted range when I got in was 108 miles (in fact I also received an automated email in the early hours telling me the charge had completed ‘with an estimated driving distance of 110.6 mile’). Of course, the first thing I did after a couple of days of restraint was to turn off Eco mode and enjoy driving the ZOE to work with a heavy right foot. I used up a big chunk of the range in short order, but I had fun! This topic contains 13 replies, has 5 voices, and was last updated by Trevor Larkum 5 years, 7 months ago. Whilst I understand the science of slow driving requiring less work and therefore increasing range, I’m not sure I’d consider limiting yourself to 30mph as improving your driving style. If I go anywhere outside of the town I live in, I need to go either on a motorway or A-roads with limited overtaking opportunities, so it’d surely be a driving offence for me to use the limiter and set it to 30mph. It seems like the Zoe will perform much better as a city car. It’s good to know it’ll go much further at lower speeds, which means at least you’ve got practical options if you find your range coming up a little short. Yes – I have a number of routes to work, including motorway or dual carriageway, but at these speeds I’m limited to country lanes. To me that sounds like a technology that could help combustion car gearboxes, but is already obsolete compared to a gearbox-free EV. An impressive set of numbers! Maybe it’s just me, but having returned to my fully charged car in the station car park this evening, I found myself wondering if I could get a charge to last 100 miles? It’s early days yet, but slow moving traffic and steady driving currently has my combined range and trip distance at 101 miles. It feels like Trevor may take some beating…..
I’m confident ZOE can do quite a bit better, with slower speeds (and a clearer/flatter route). The big problem is time – it’s one thing to travel 120 miles at 60 mph, quite another to do it at 25 mph. Wow – good link, Nosig. That will make a great post for the blog. I’m getting a bit confused over how to get the best range. Today I tried a flatter route to work with few junctions (I had to do very little braking in the whole journey). 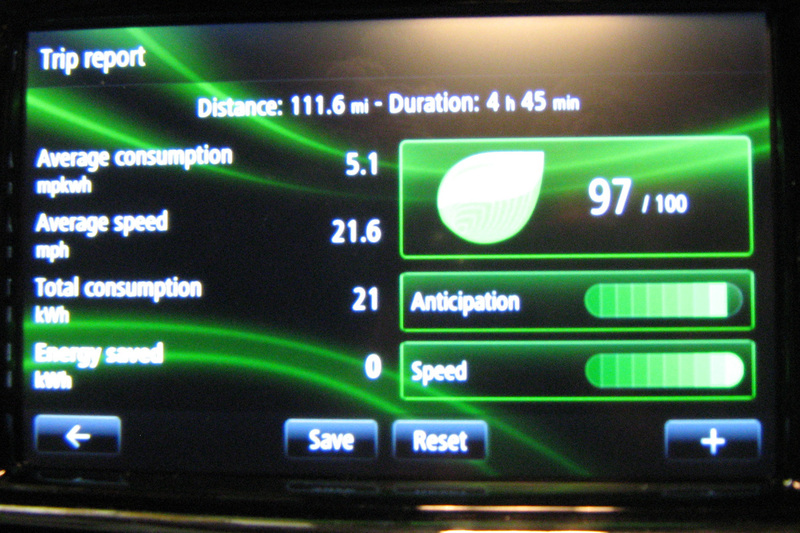 I used Eco mode, and had the speed limited to 30mph (with just a few bits at 35/40 where I was slowing up traffic). I got just 4.5 miles/kWh, it was very disappointing. 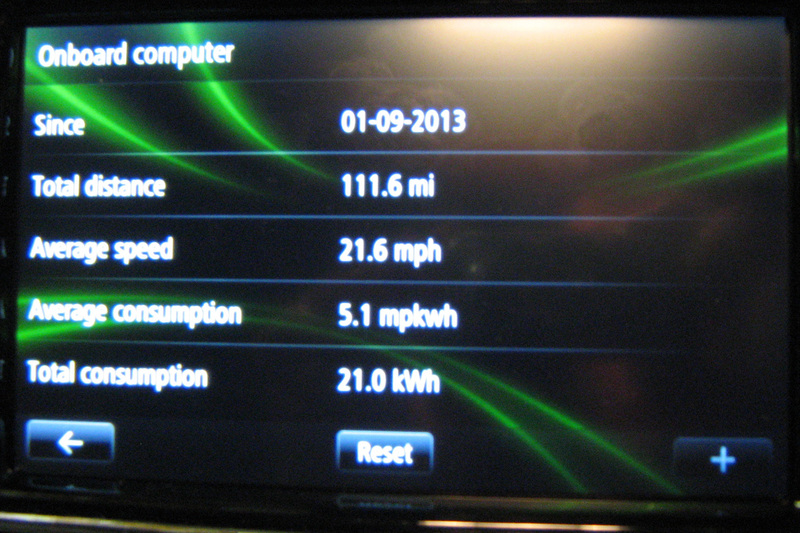 It’s not hugely different to what I got above (5.1 miles/kWh), but still a long way below what the Spanish guy achieved. 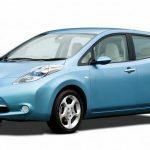 He managed as little as 8.4kWh/100km (8.4kWh/62.14 miles), which is an amazing 7.4 miles/kWh – what am I doing wrong? It was raining – I wonder if the cold(er) weather, and perhaps some use of headlights (it’s permanently on auto) might explain it. However, it has put me off trying again until I work out how to do better (particularly as it took an hour for what is normally a 40 minute journey). Any ideas anyone? Can anyone speak Spanish and pass on tips from the video? !